In modern-day dentistry. 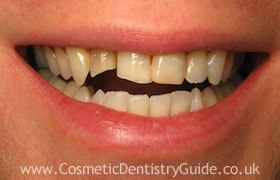 there is a wide variety of dental materials to choose from. Some crowns are made from full gold, where as others are made from an alloy of metals fused to a porcelain outer shell. 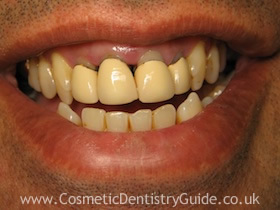 After time, crowns that are made from a combination of metal fused to porcelain can begin to show dark gum lines that are not aesthetically attractive. 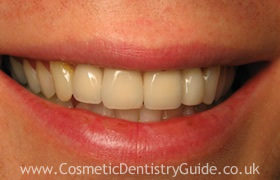 All-porcelain or -ceramic crowns are the best choice for a natural cosmetic look. There are many different brands and types of porcelain crowns, and the variation between the costs of dental crowns at different dental practices may well reflect the quality of the materials used. 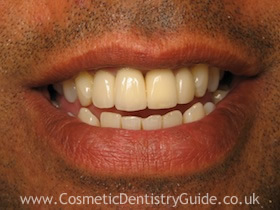 The animations above illustrate the dental crown procedure. The price varies between dental practices, but you can expect to pay from £300 per tooth up to £1,100 per tooth, depending on where you go for your treatment. The price will depend on the skill of the dentist, the quality of the crown and the materials used, and the number of teeth you are having crowned.